Creating a website for your spa and massage salon is quite easy with WordPress and WooCommerce. Using the Jacqueline WordPress Theme, you will find ample resources to set up your spa and massage salon website. The theme comes loaded with a set of plugins that will help you set up an option to book services according to your calendar. It is also important that you maintain a help desk system on your WordPress salon site, so that customers can easily contact you. 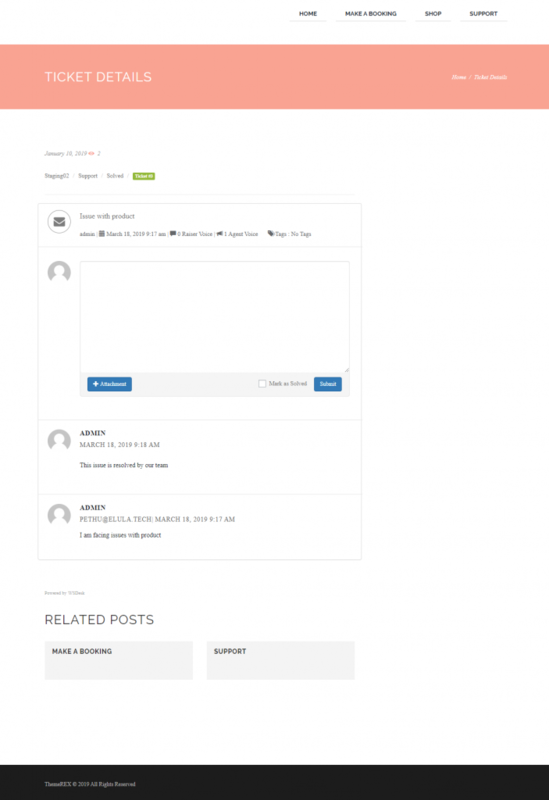 As WSDesk WordPress Help desk plugin is fully compatible with Jacqueline theme, you can easily manage this as well. Why this compatibility is important for salon owners? Jacqueline is one of the most popular WordPress themes that you can use to set up a WordPress website for your spa or salon. And, when you look for a help desk system, WSDesk will be one of the obvious choices. So, when you are already using one of these solutions, and then decide to use the other one, the process should be seamless. When you install and configure WSDesk, you will notice it creates a support form, which will help your users to raise a ticket on your store. The seamless integration of this support form is particularly important when you are using both solutions together. Individual ticket and its responses. First, we will see how the support page of WSDesk help desk plugin looks like on Jacqueline WordPress theme. 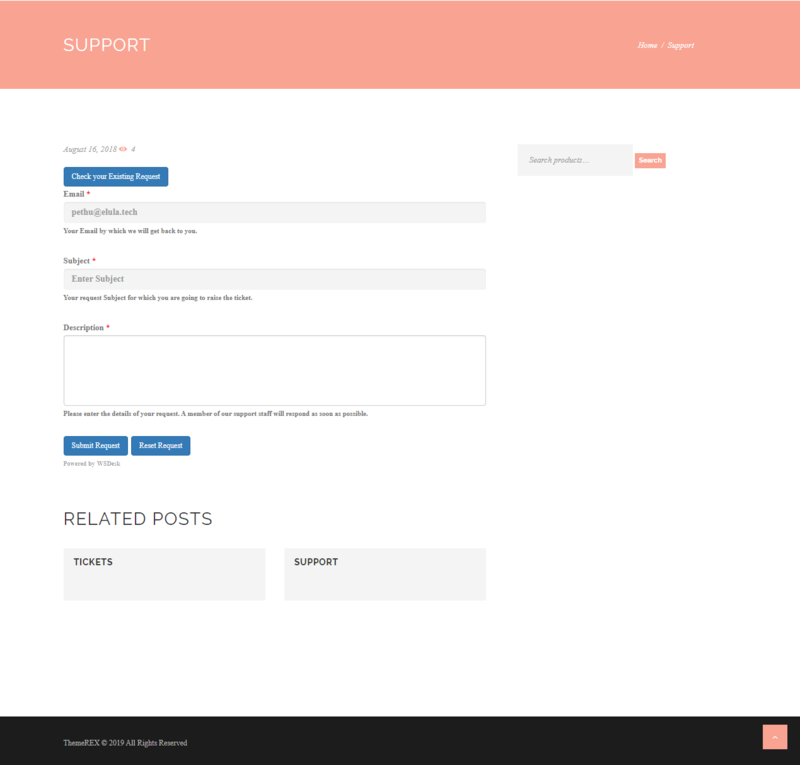 Here is a screenshot of the support request page of WSDesk, when you are using Jacqueline theme. The second customer facing page is the one that lists existing customer tickets. When a customer clicks the button for existing tickets, they can see all their previous tickets and their status. Your customers will be able to see even the color coded ticket status, that will help them easily identify the status of tickets.They can even use the filter to view only tickets of a particular status. When a ticket is opened, customers will be able to view the details of the ticket including the replies for it. Why use Jacqueline WordPress theme? You might be wondering what sets apart Jacqueline WordPress theme from other similar themes. Here is a look at some of the features of Jacqueline WordPress theme that makes it one of the best options for a salon or spa website. You will be able to create a responsive and stylish website for your spa and massage salon with advanced features using this theme. This theme is good even for a personal website that offers services for a specific period of time. The theme offers full support for WooCommerce, so you can easily sell beauty or cosmetic products through your store. You can very easily install the theme and design your website according to your needs. There is no need for any advanced coding knowledge to handle the theme settings. Getting started with this theme is pretty easy. You can install a demo with a single click. After this, you can easily change the content and media according to the specifics of your site. You will find a range of pre-built pages that will help you set up your site quite fast. Moreover, you can make further modifications based on your creative interests. Jacqueline is compatible to WP Bakery plugin, so you can easily build custom page layouts while using this theme. You will find different header styles as well with this plugin, from which you can choose a suitable one. Changing the color scheme is also quite easy while using this popular WordPress theme. You can easily change the color scheme of the entire site, or simply change the color scheme of individual elements without hassles. As the theme and its code are SEO optimized, you have nothing to worry about search engine ranking and traffic. As a result, there will be enhanced traffic to your site, and your business will have better reach. For a spa and salon website, online booking option is an important requirement. As the theme is compatible with several booking plugins, you can easily create a booking option on your site. This way, customers will be able to book a service or treatment easily through your website. Jacqueline theme offers extended theme options to help you design your website the way you want it. You will find several shortcodes to add features on the site. 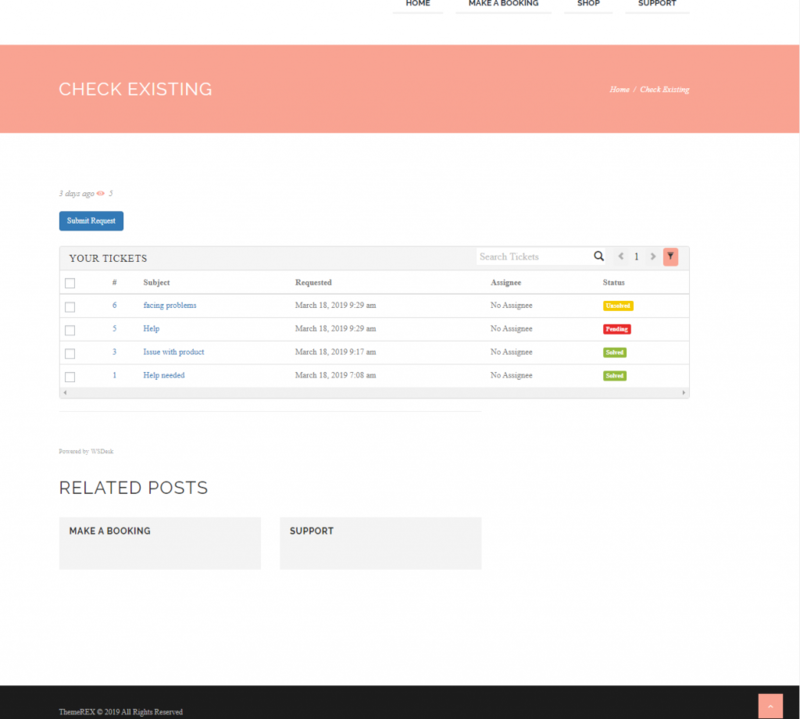 The theme offers a powerful admin interface as well. The theme supports sticky menus as well as offers parallax effect backgrounds. Updates are also quite easy to handle while using this plugin. As you already know, WSDesk WordPress Help desk plugin is one of the popular options to set up a customer support system on your store. It helps you set up a ticketing system, where your customers will be able to raise tickets to resolve issues. You will be able to create unlimited tickets and agent profiles on your store with this plugin. As it is a WordPress plugin that you can install on your store, WSDesk gives you complete control over your customers’ data on your store. Here is a reminder of some of the top features of WSDesk WordPress Help desk plugin. WSDesk offers a powerful interface that is quite user friendly. You will be able to handle tickets on the backend effortlessly using this plugin. The Ajax-based interface makes page loads quite fast, and your agents will be able to create several views according to ticket status, agents, ticket source, etc. Switching from one view to another is quite fast and contributes to the overall efficiency of your customer support system. The support form is the primary interface that your customers will see of WSDesk. It offers options to customize support form as well. You can add additional fields to the support form, as well as create multiple support forms using WSDesk. WSDesk automatically converts emails sent to the support id into tickets. This feature can help improve the customer experience on your site. WSDesk offers seamless integration with WooCommerce. While raising a ticket, your customers will be able to associate it to a specific product. Options to automate your customer support system will help you a lot in managing customer queries more efficiently. With WSDesk’s options to automate, you will be able to streamline the workflow of your customer support better. For example, based on the nature of the ticket, you can automatically assign it to a specific agent or department. Or you can create notifications specific to particular agents, when a new ticket is created, or when a ticket is associated with a particular product. Your agents will be able to used canned responses or saved answers for common queries that are repeating often. This will reduce the workload of your support agents as well as improve the response time on your store. WSDesk also offers extensive reporting features to help you assess the efficiency of your customer support system. You can generate reports based on agents, date, tags, etc. Also, there is an option for satisfaction survey report, which you can ask your customers to fill in after resolving each ticket. If you require any clarification regarding WSDesk features, please contact our support team. You can understand more about the configuration of the plugin from the documentation.